Cruise Baltic’s mid-year Conference was held in Tallinn, Estonia’s capital and cruise port. More than 75 participants representing 25 Baltic ports and destinations attended the two-day event. Overseeing the event was Cruise Baltic Director Bo Larsen. Day 2 of the conference included presentations and Q&A panels. Featured speakers included Bruce Krumrine, vice president-shore operations, Europe & Exotics, Princess Cruises; Torsten Edens, head of international sales for Albatros Travel in Denmark; Allan Donoghue, port lecturer fleet trainer for Royal Caribbean and Celebrity Cruises; Eduardo López-Puertas, vice president-land operations for Pullmantur; Tim Marking, secretary general for the European Cruise Council (ECC); Tom Strang, vice president-policy and regulation, maritime policy and compliance for Carnival Corp. & plc; Erik Ringmaa, chief commercial officer, Port of Tallinn; Geraldine Tate, shore excursion executive for Thomson Cruises; and Claire Martin, product manager for Noble Caledonia Ltd. In between the business sessions, the City and Port of Tallinn showcased attractions, including a walk through the medieval Old Town just a short distance from the cruise berths, the picturesque town square, and dinner at the 300-year-old Kadriorg Palace. With its five existing cruise berths and Saaremaa (a small island 135 miles away), Tallinn welcomed 301 cruise ships and 437,000 passengers in 2011, with a similar number expected in 2012. 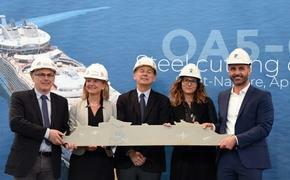 Increased demand is resulting in the construction of a new berth, scheduled in time for the 2014 season. The new berth/pier is being planned as a destination, with shopping, entertainment and restaurant areas. “We have been cruising in the Baltic for 30 years, and in this time we have seen an increase in the length of seasonality,” Krumrine said. In shore excursion surveys, their cruise passengers rated tours in the Baltic at 80 percent and higher. “With five ships operating in the Baltic this summer, our focus is to ensure accuracy of destination information for our guests, ensuring their experience is memorable,” Donoghue said. He stressed that the role of port lecturers on board is vital and key to the success of the guest’s port experience -- the content must be delivered articulately and be factually correct. Cruise Baltic is a network of cruise destinations in the Baltic Sea offering easy access to 10 countries. The association, which started in 2004 with 12 destinations, has now grown to 25 destinations.